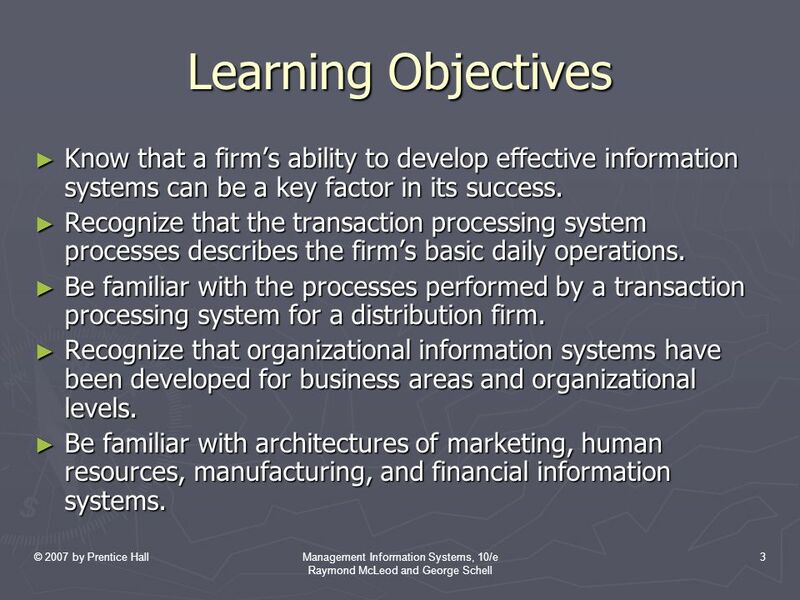 © 2007 by Prentice Hall Management Information Systems, 10/e Raymond McLeod and George Schell 1 Management Information Systems, 10/e Raymond McLeod Jr.
3 © 2007 by Prentice HallManagement Information Systems, 10/e Raymond McLeod and George Schell 3 Learning Objectives ► Know that a firm’s ability to develop effective information systems can be a key factor in its success. ► Recognize that the transaction processing system processes describes the firm’s basic daily operations. ► Be familiar with the processes performed by a transaction processing system for a distribution firm. 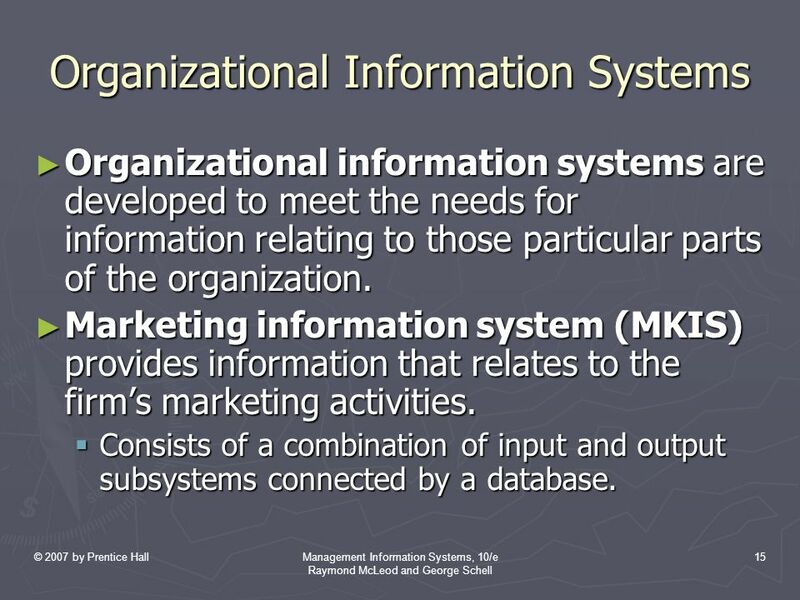 ► Recognize that organizational information systems have been developed for business areas and organizational levels. 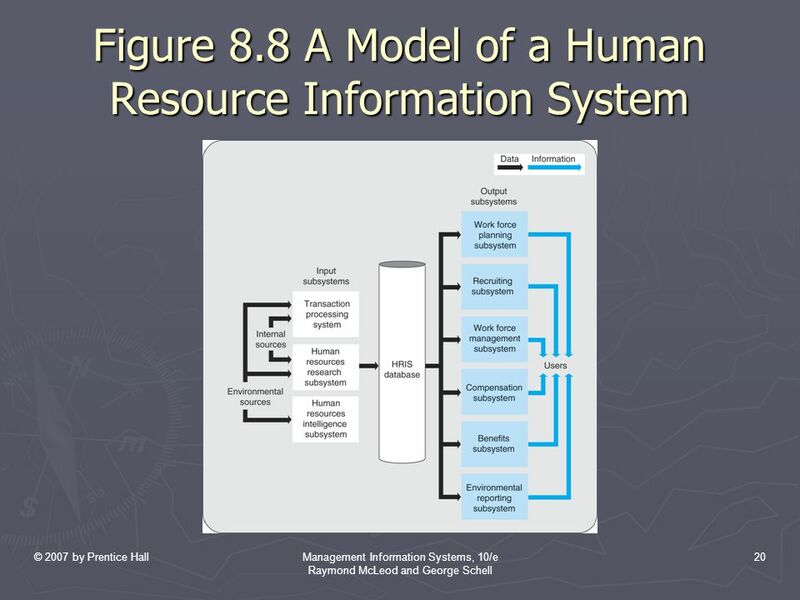 ► Be familiar with architectures of marketing, human resources, manufacturing, and financial information systems. 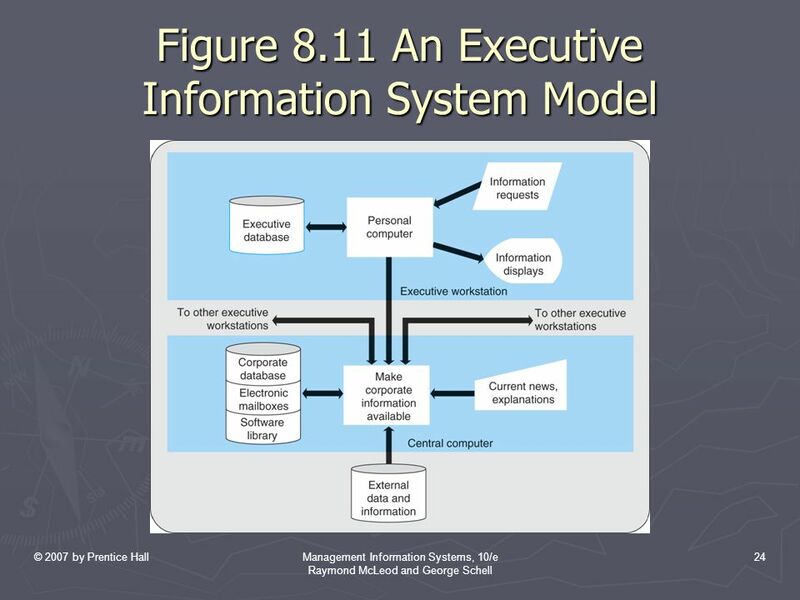 4 © 2007 by Prentice HallManagement Information Systems, 10/e Raymond McLeod and George Schell 4 Learning Objectives (Cont’d) ► Know the architecture of an executive information system. 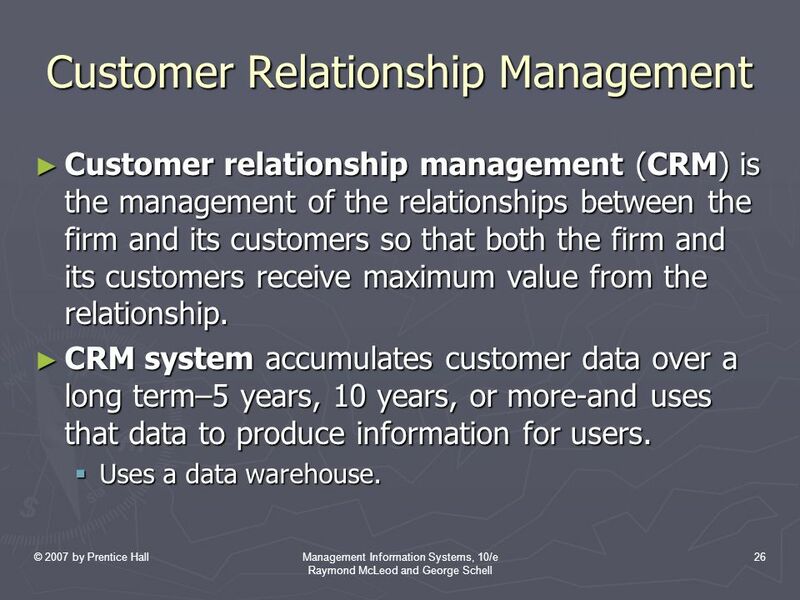 ► Understand what customer relationship management is and why it requires a large computer storage capability. 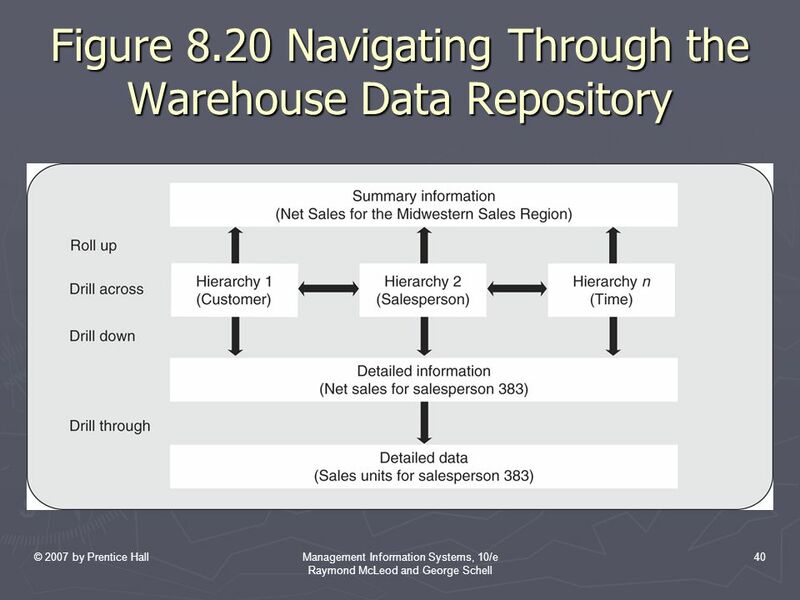 ► Recognize how a data warehouse differs from a database. 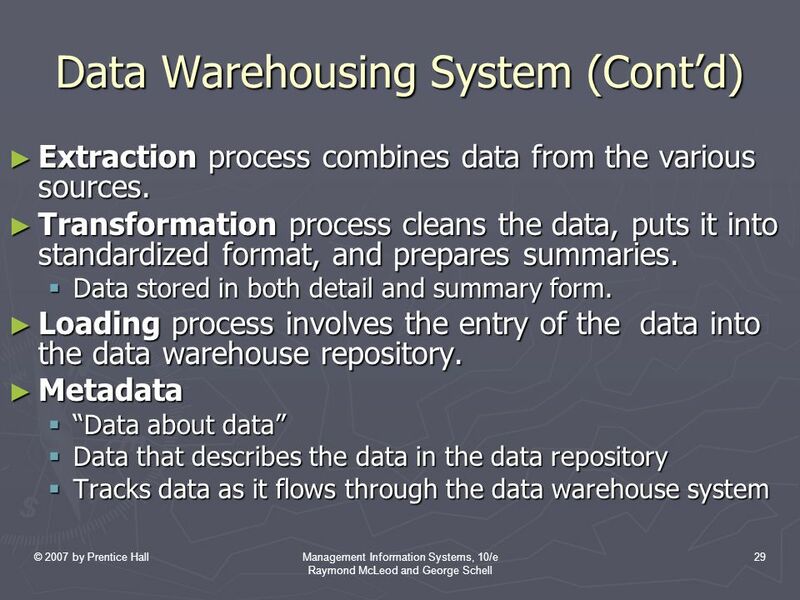 ► Understand the architecture of a data warehouse system. 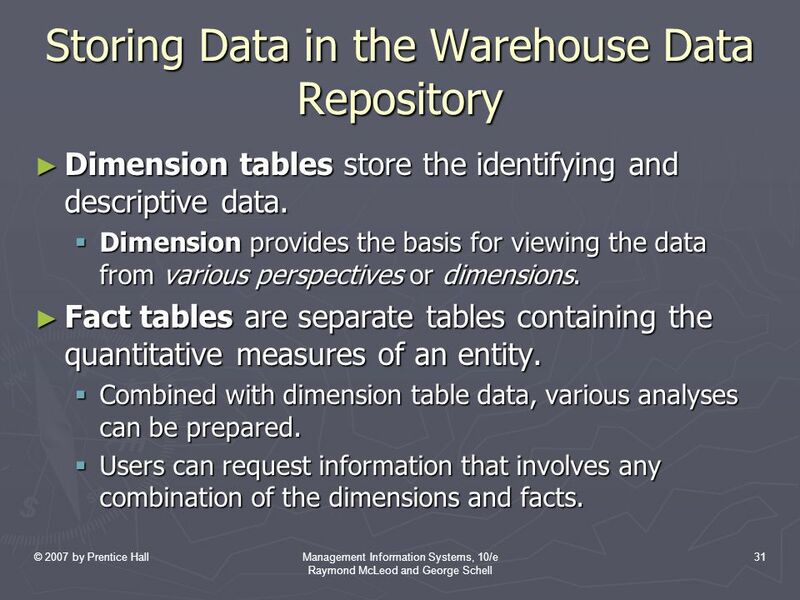 ► Know how data are stored in a data warehouse data repository. ► Know how a user navigates through the data repository. 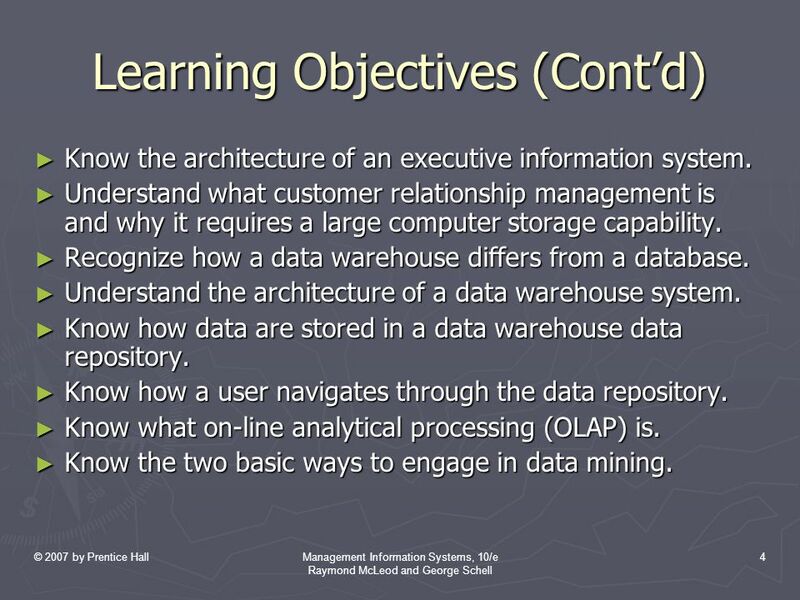 ► Know what on-line analytical processing (OLAP) is. 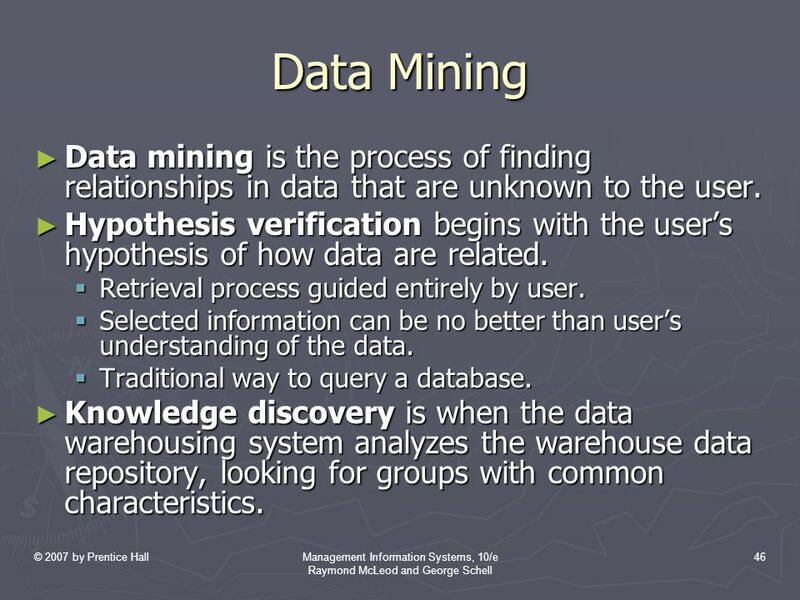 ► Know the two basic ways to engage in data mining. 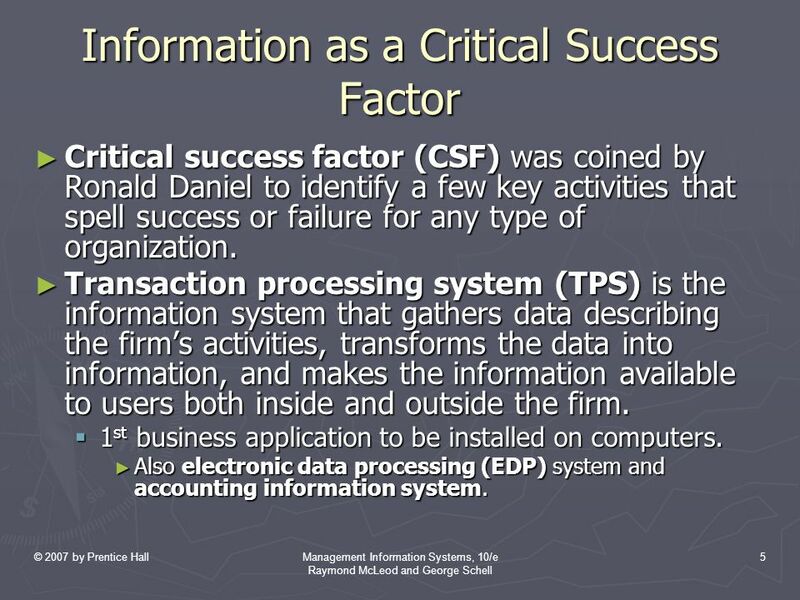 5 © 2007 by Prentice HallManagement Information Systems, 10/e Raymond McLeod and George Schell 5 Information as a Critical Success Factor ► Critical success factor (CSF) was coined by Ronald Daniel to identify a few key activities that spell success or failure for any type of organization. 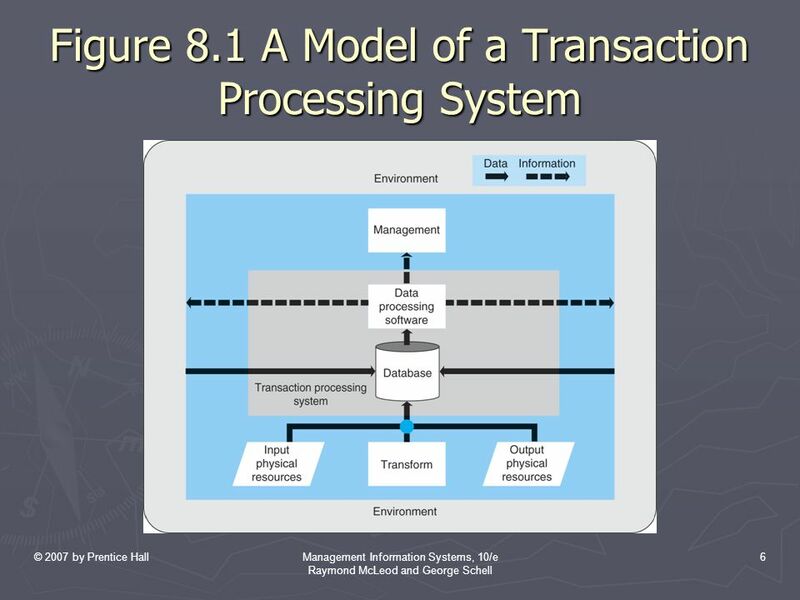 ► Transaction processing system (TPS) is the information system that gathers data describing the firm’s activities, transforms the data into information, and makes the information available to users both inside and outside the firm.  1 st business application to be installed on computers. ► Also electronic data processing (EDP) system and accounting information system. 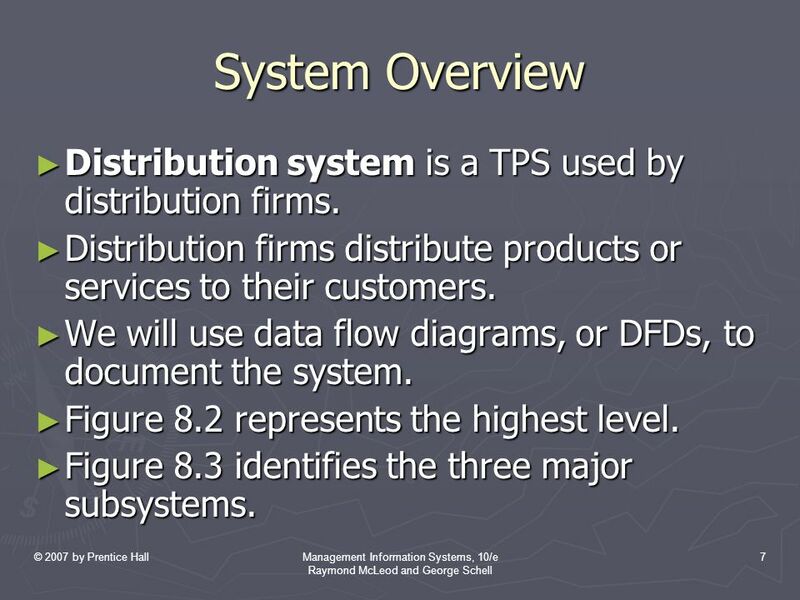 7 © 2007 by Prentice HallManagement Information Systems, 10/e Raymond McLeod and George Schell 7 System Overview ► Distribution system is a TPS used by distribution firms. 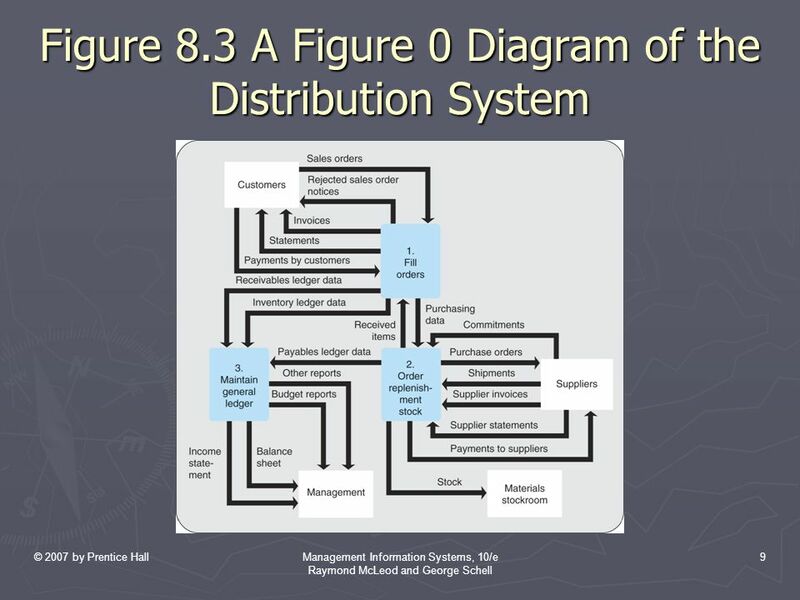 ► Distribution firms distribute products or services to their customers. 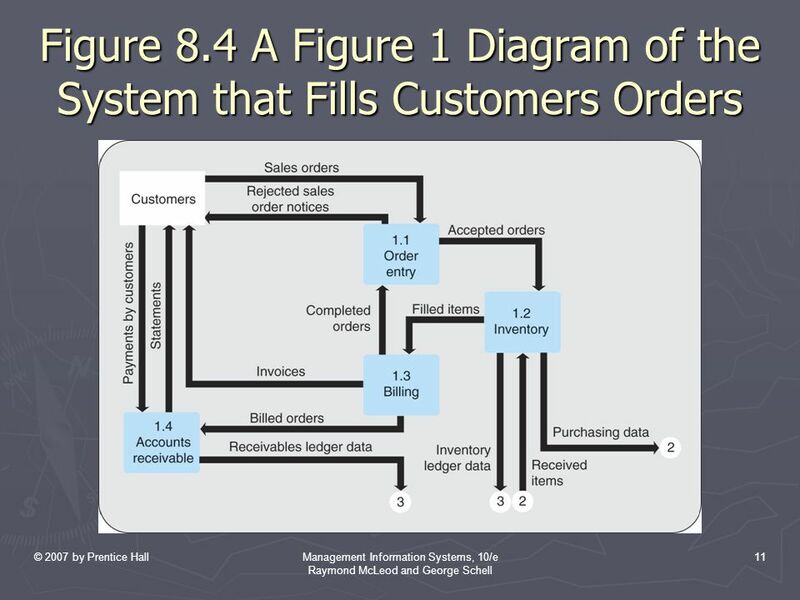 ► We will use data flow diagrams, or DFDs, to document the system. ► Figure 8.2 represents the highest level. ► Figure 8.3 identifies the three major subsystems. 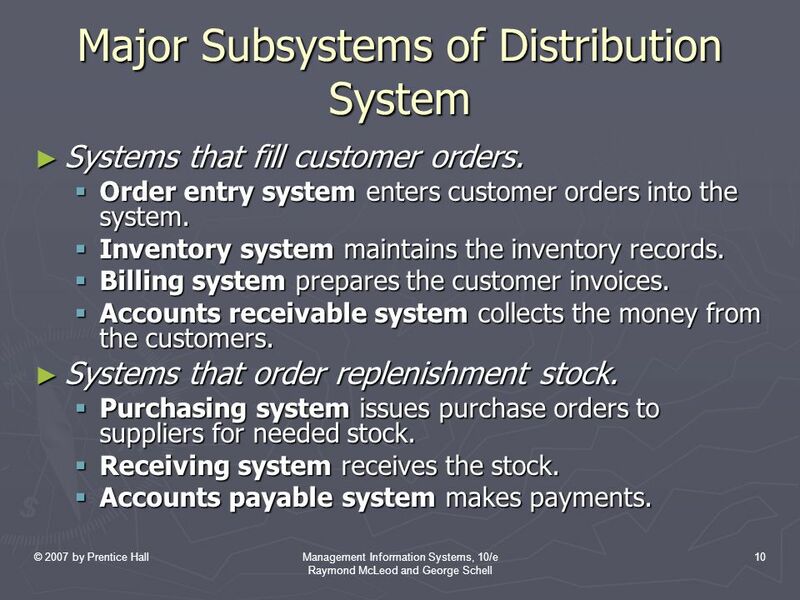 10 © 2007 by Prentice HallManagement Information Systems, 10/e Raymond McLeod and George Schell 10 Major Subsystems of Distribution System ► Systems that fill customer orders.  Order entry system enters customer orders into the system.  Inventory system maintains the inventory records.  Billing system prepares the customer invoices.  Accounts receivable system collects the money from the customers. 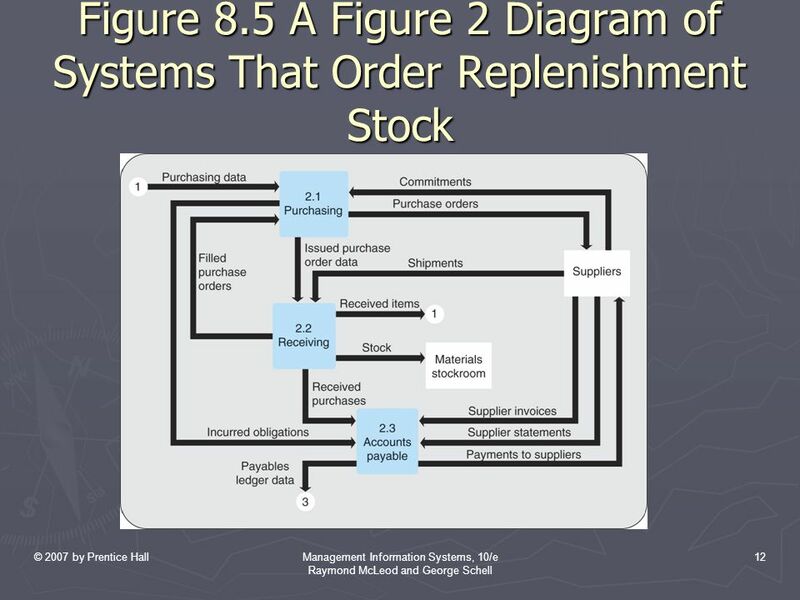 ► Systems that order replenishment stock.  Purchasing system issues purchase orders to suppliers for needed stock.  Receiving system receives the stock.  Accounts payable system makes payments. 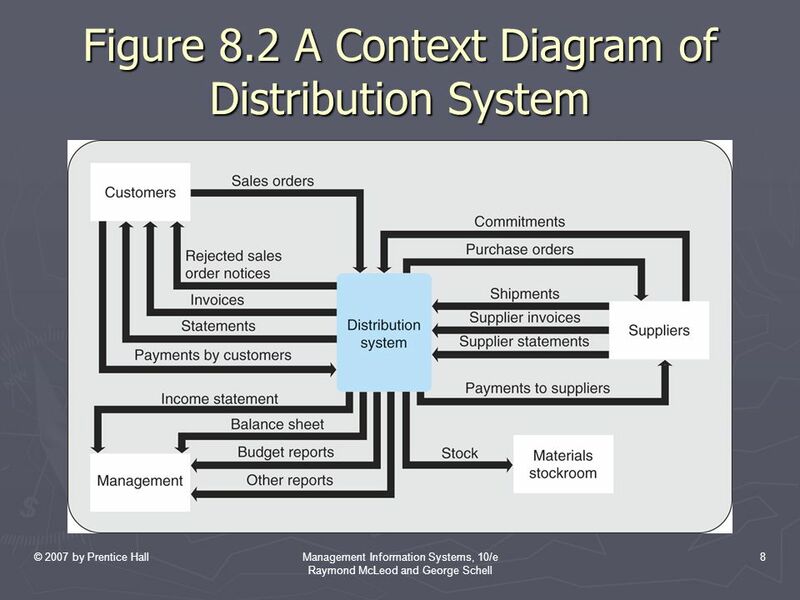 13 © 2007 by Prentice HallManagement Information Systems, 10/e Raymond McLeod and George Schell 13 Major Subsystems of Distribution System (Cont’d) ► Systems that perform general ledger processes. 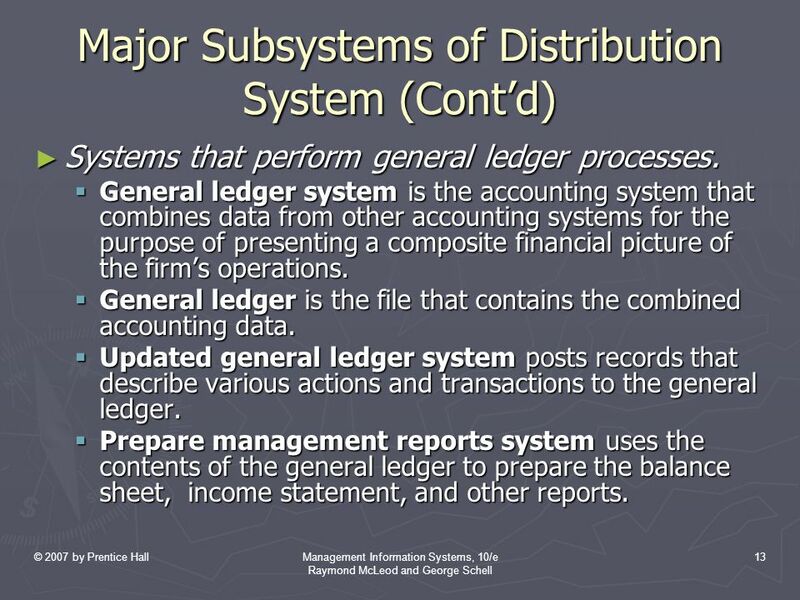  General ledger system is the accounting system that combines data from other accounting systems for the purpose of presenting a composite financial picture of the firm’s operations.  General ledger is the file that contains the combined accounting data. 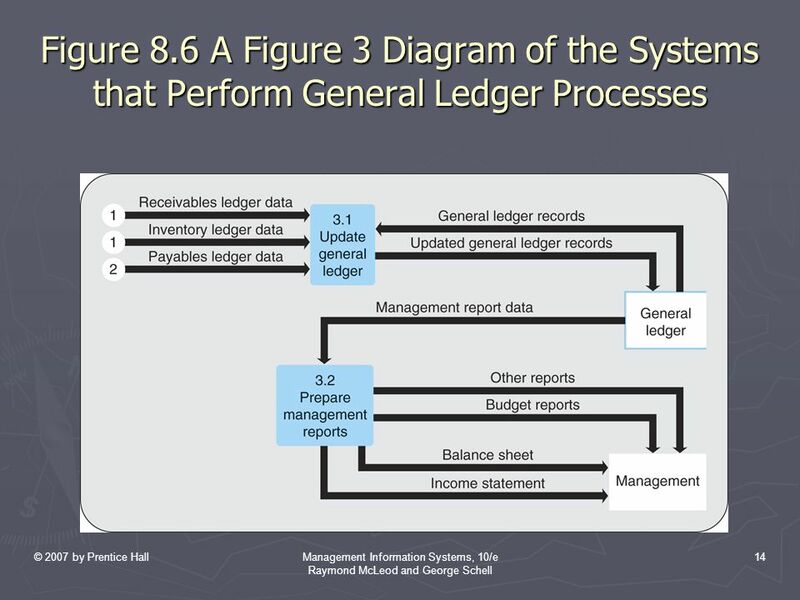  Updated general ledger system posts records that describe various actions and transactions to the general ledger.  Prepare management reports system uses the contents of the general ledger to prepare the balance sheet, income statement, and other reports. 15 © 2007 by Prentice HallManagement Information Systems, 10/e Raymond McLeod and George Schell 15 Organizational Information Systems ► Organizational information systems are developed to meet the needs for information relating to those particular parts of the organization. 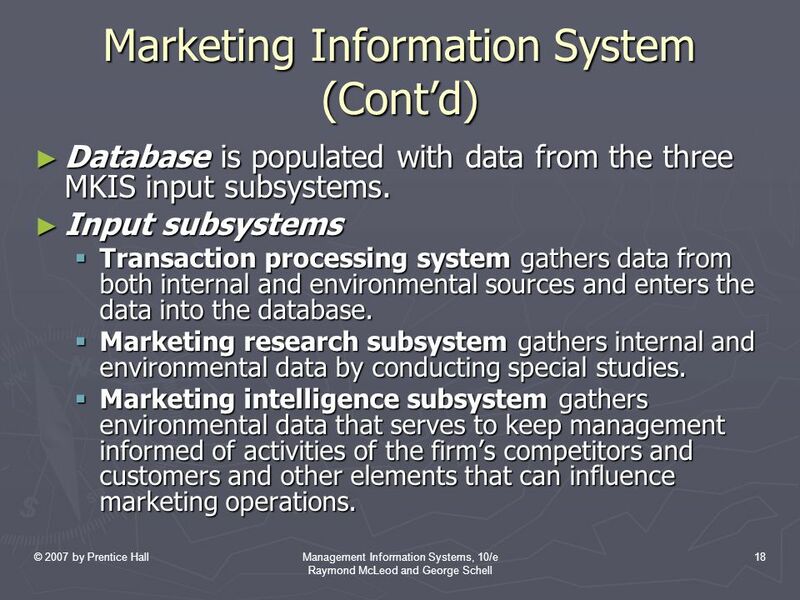 ► Marketing information system (MKIS) provides information that relates to the firm’s marketing activities.  Consists of a combination of input and output subsystems connected by a database. 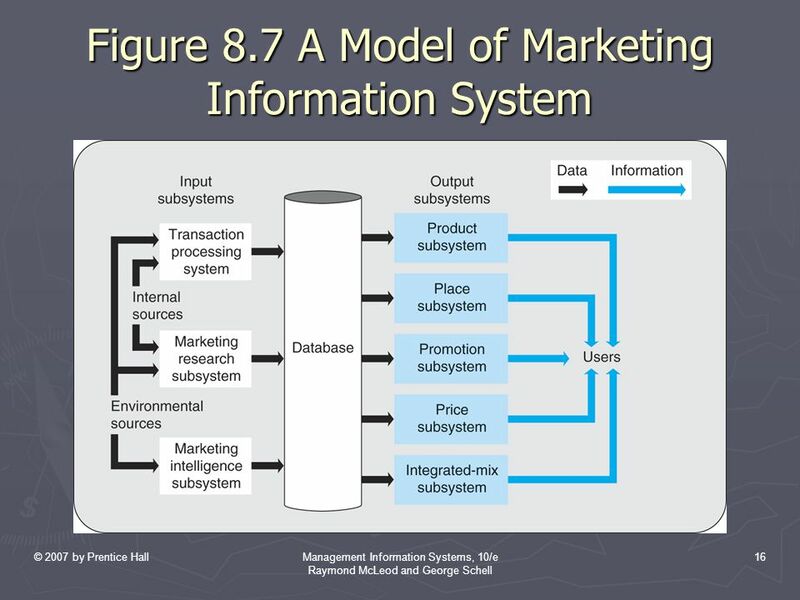 17 © 2007 by Prentice HallManagement Information Systems, 10/e Raymond McLeod and George Schell 17 Marketing Information System ► Output subsystems provide information about critical elements in marketing mix. 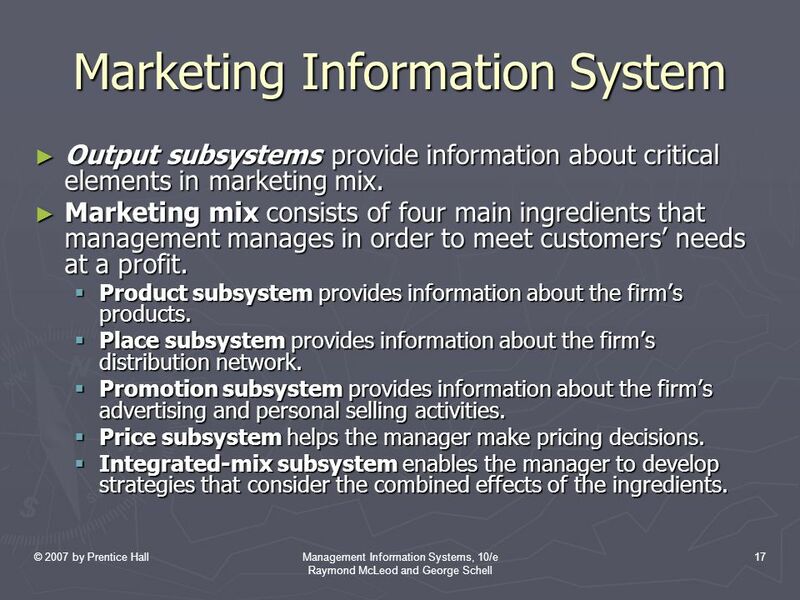 ► Marketing mix consists of four main ingredients that management manages in order to meet customers’ needs at a profit.  Product subsystem provides information about the firm’s products.  Place subsystem provides information about the firm’s distribution network.  Promotion subsystem provides information about the firm’s advertising and personal selling activities.  Price subsystem helps the manager make pricing decisions.  Integrated-mix subsystem enables the manager to develop strategies that consider the combined effects of the ingredients. 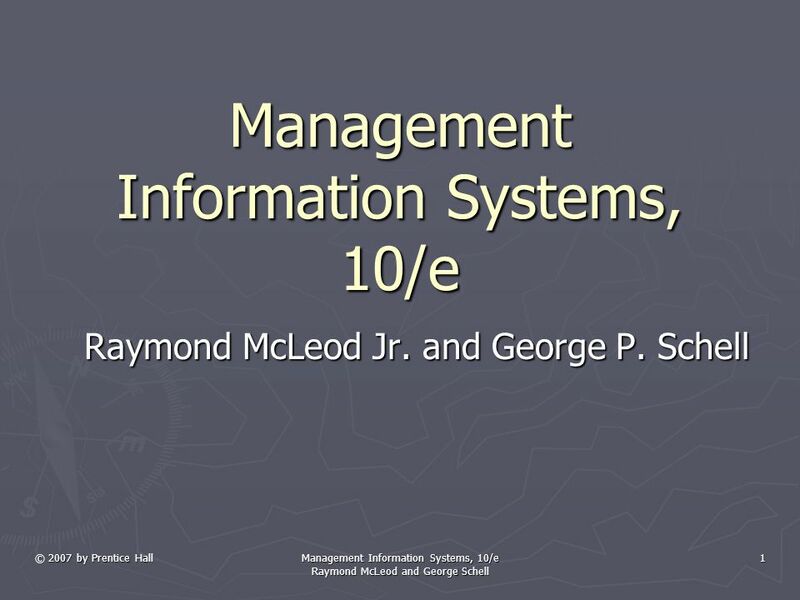 18 © 2007 by Prentice HallManagement Information Systems, 10/e Raymond McLeod and George Schell 18 Marketing Information System (Cont’d) ► Database is populated with data from the three MKIS input subsystems. 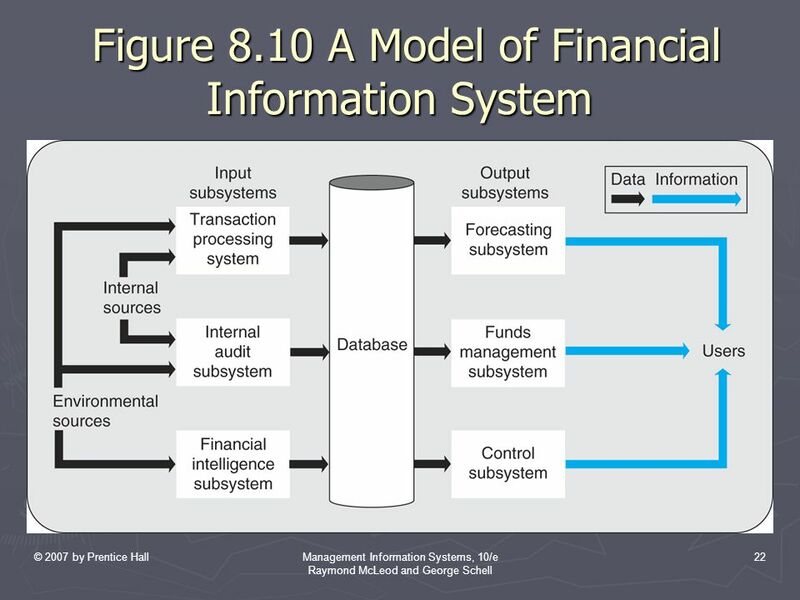 ► Input subsystems  Transaction processing system gathers data from both internal and environmental sources and enters the data into the database.  Marketing research subsystem gathers internal and environmental data by conducting special studies.  Marketing intelligence subsystem gathers environmental data that serves to keep management informed of activities of the firm’s competitors and customers and other elements that can influence marketing operations. 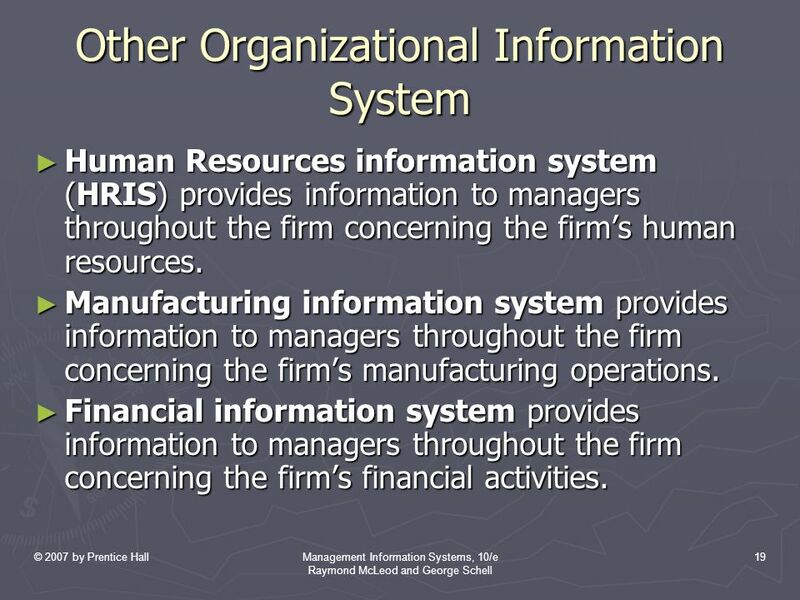 19 © 2007 by Prentice HallManagement Information Systems, 10/e Raymond McLeod and George Schell 19 Other Organizational Information System ► Human Resources information system (HRIS) provides information to managers throughout the firm concerning the firm’s human resources. 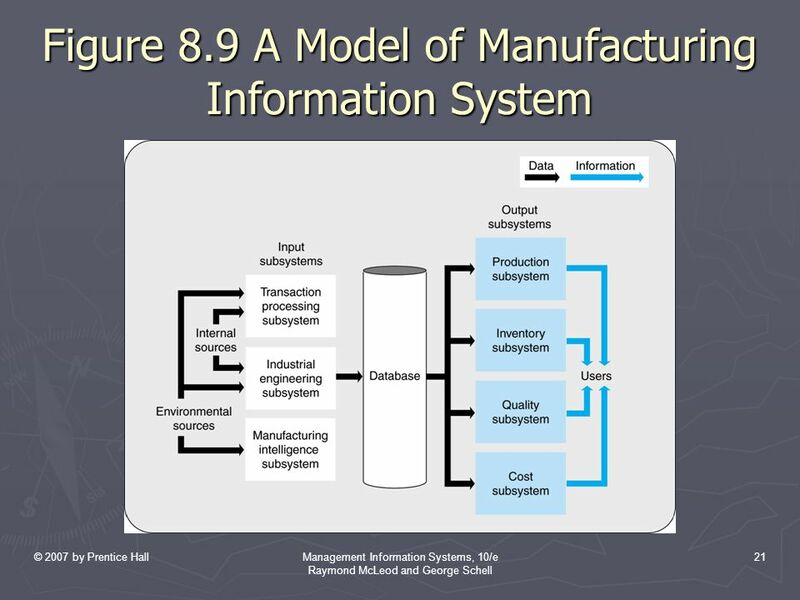 ► Manufacturing information system provides information to managers throughout the firm concerning the firm’s manufacturing operations. ► Financial information system provides information to managers throughout the firm concerning the firm’s financial activities. 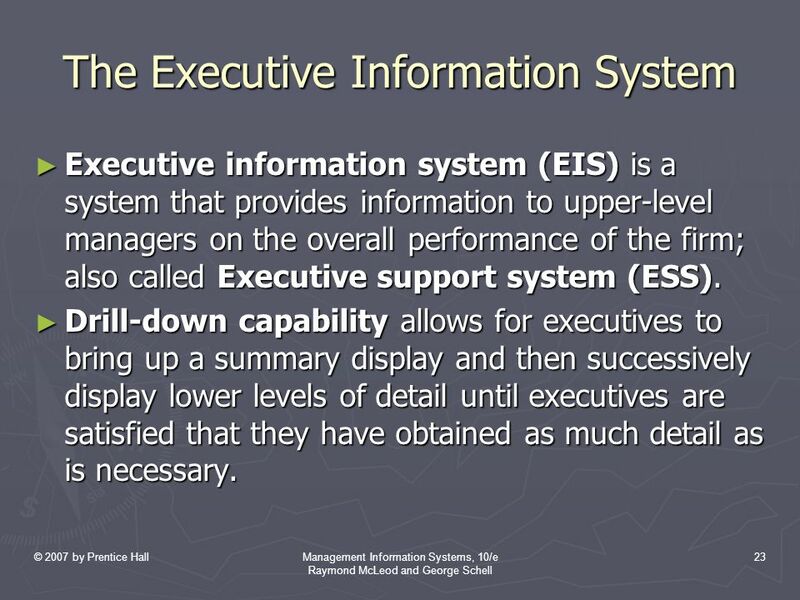 23 © 2007 by Prentice HallManagement Information Systems, 10/e Raymond McLeod and George Schell 23 The Executive Information System ► Executive information system (EIS) is a system that provides information to upper-level managers on the overall performance of the firm; also called Executive support system (ESS). ► Drill-down capability allows for executives to bring up a summary display and then successively display lower levels of detail until executives are satisfied that they have obtained as much detail as is necessary. 26 © 2007 by Prentice HallManagement Information Systems, 10/e Raymond McLeod and George Schell 26 Customer Relationship Management ► Customer relationship management (CRM) is the management of the relationships between the firm and its customers so that both the firm and its customers receive maximum value from the relationship. ► CRM system accumulates customer data over a long term–5 years, 10 years, or more-and uses that data to produce information for users. 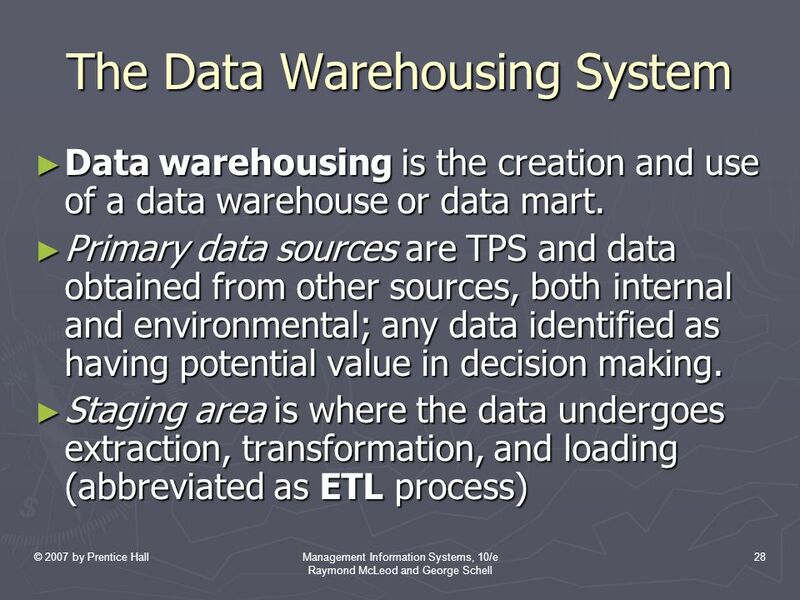  Uses a data warehouse. 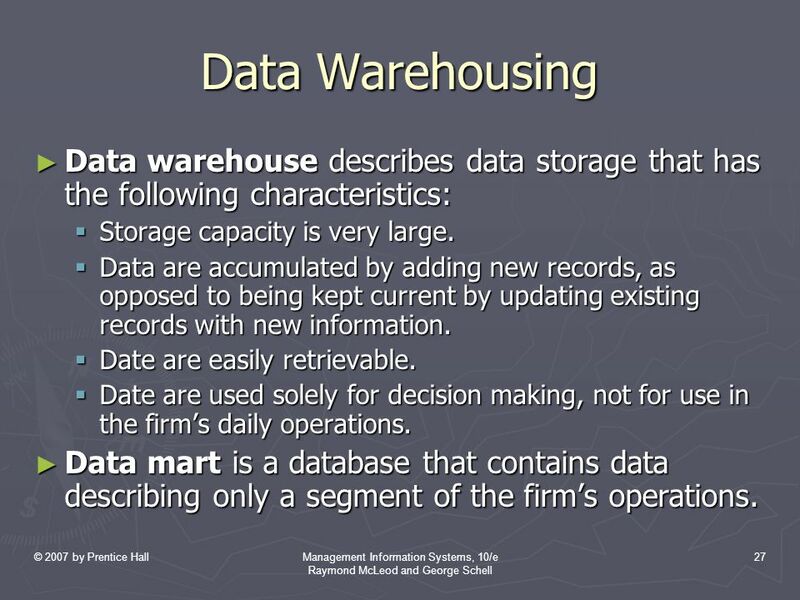 27 © 2007 by Prentice HallManagement Information Systems, 10/e Raymond McLeod and George Schell 27 Data Warehousing ► Data warehouse describes data storage that has the following characteristics:  Storage capacity is very large.  Data are accumulated by adding new records, as opposed to being kept current by updating existing records with new information.  Date are easily retrievable.  Date are used solely for decision making, not for use in the firm’s daily operations. ► Data mart is a database that contains data describing only a segment of the firm’s operations. 31 © 2007 by Prentice HallManagement Information Systems, 10/e Raymond McLeod and George Schell 31 Storing Data in the Warehouse Data Repository ► Dimension tables store the identifying and descriptive data.  Dimension provides the basis for viewing the data from various perspectives or dimensions. 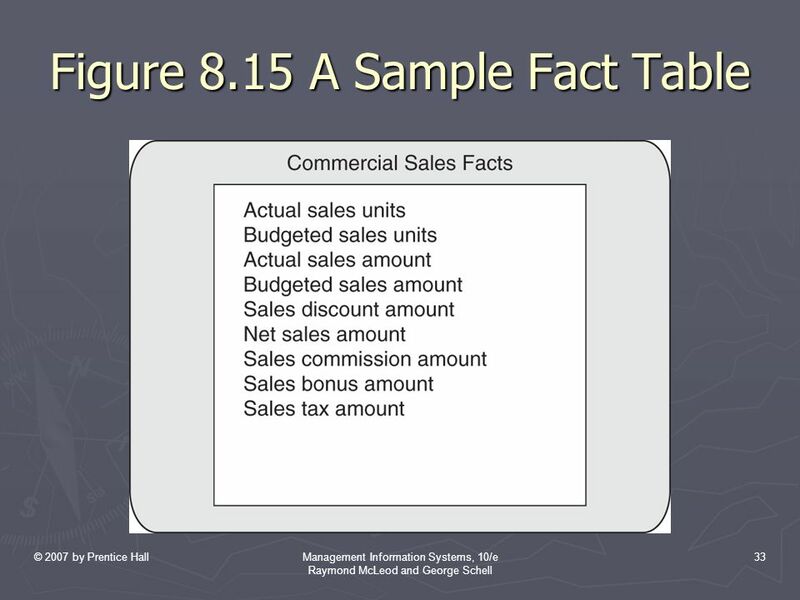 ► Fact tables are separate tables containing the quantitative measures of an entity. 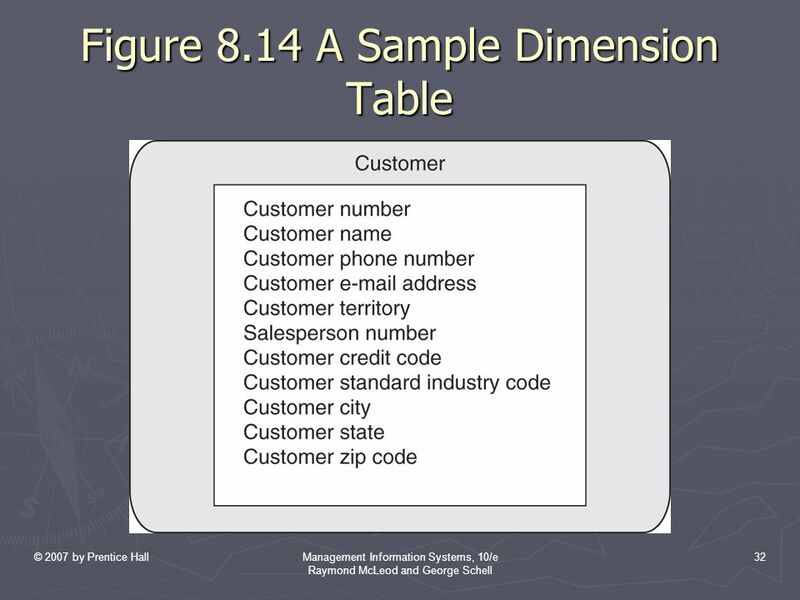  Combined with dimension table data, various analyses can be prepared.  Users can request information that involves any combination of the dimensions and facts. 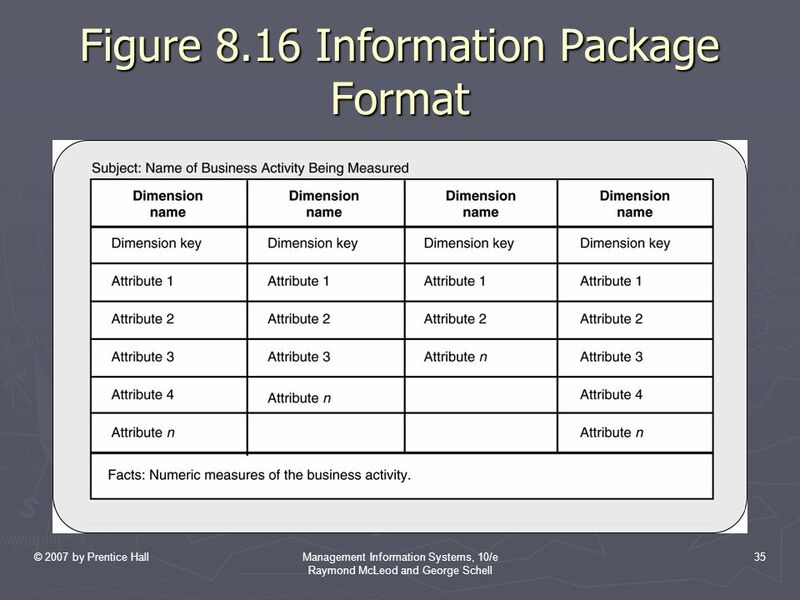 34 © 2007 by Prentice HallManagement Information Systems, 10/e Raymond McLeod and George Schell 34 Storing Data … (Cont’d) ► Information package identifies all of the dimensions that will be used in analyzing a particular activity. 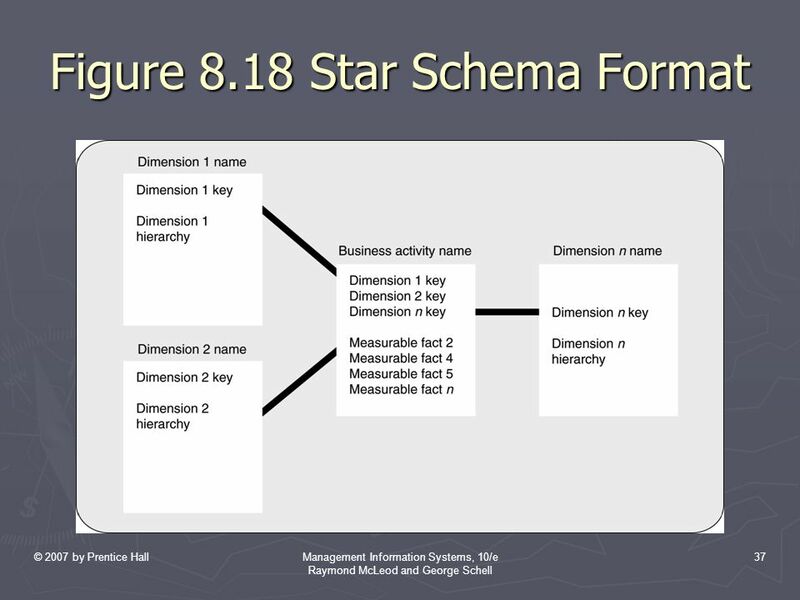 ► Star schema-for each dimension, a key identifies the dimension and provides the link to the information package that results in a structure that is similar to the pattern of a star. 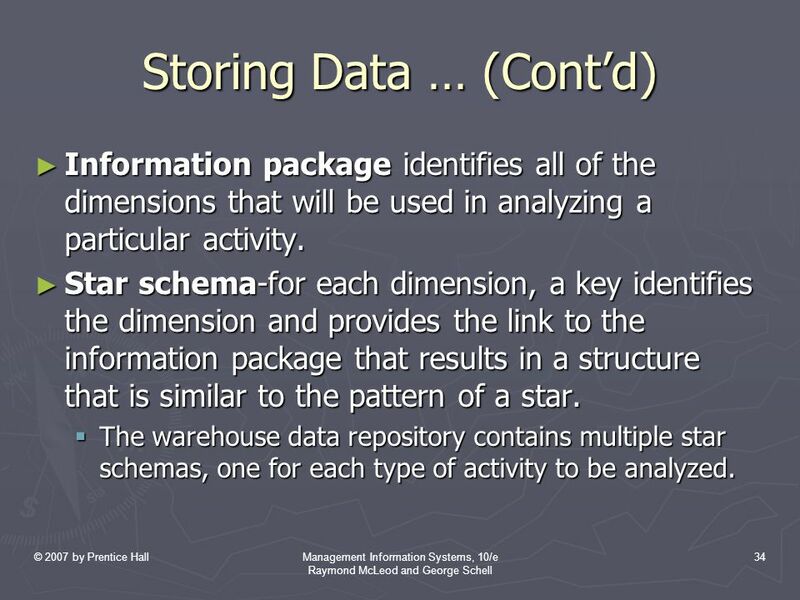  The warehouse data repository contains multiple star schemas, one for each type of activity to be analyzed. 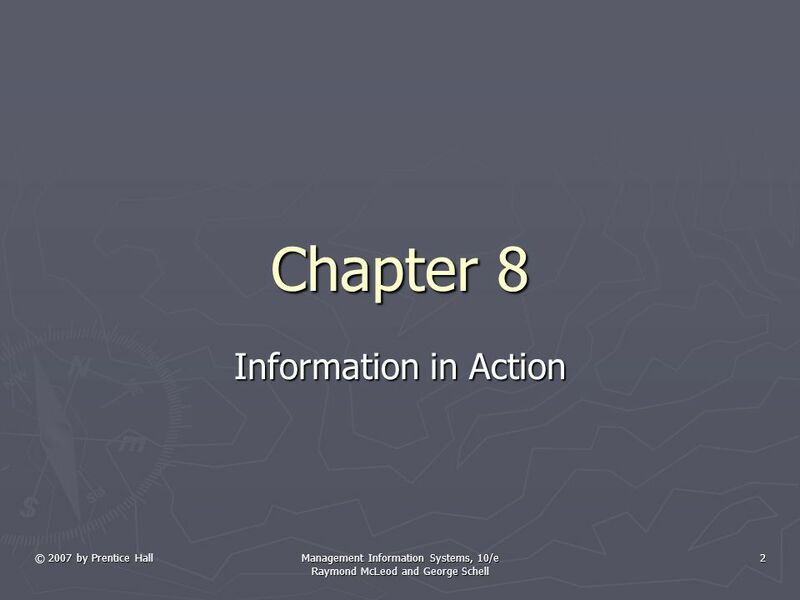 39 © 2007 by Prentice HallManagement Information Systems, 10/e Raymond McLeod and George Schell 39 Information Delivery ► Drill down-the process of navigating down through the levels of detail. 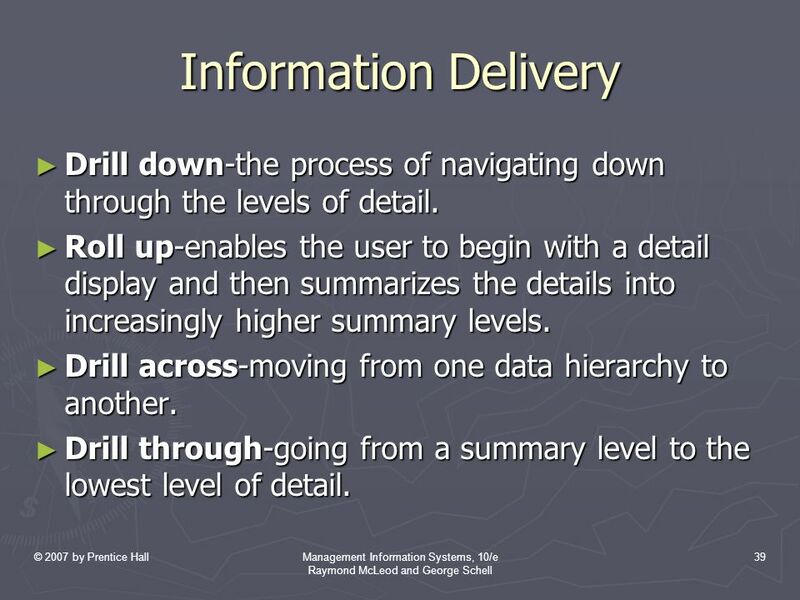 ► Roll up-enables the user to begin with a detail display and then summarizes the details into increasingly higher summary levels. 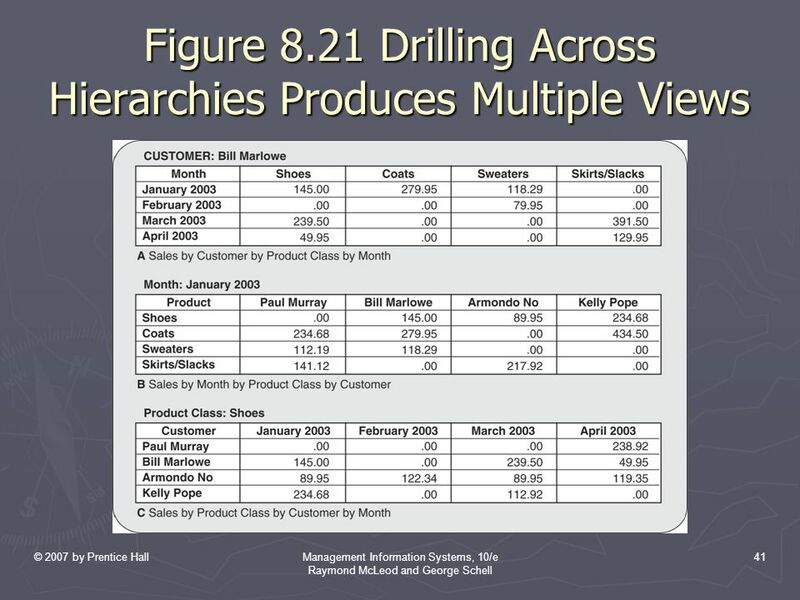 ► Drill across-moving from one data hierarchy to another. 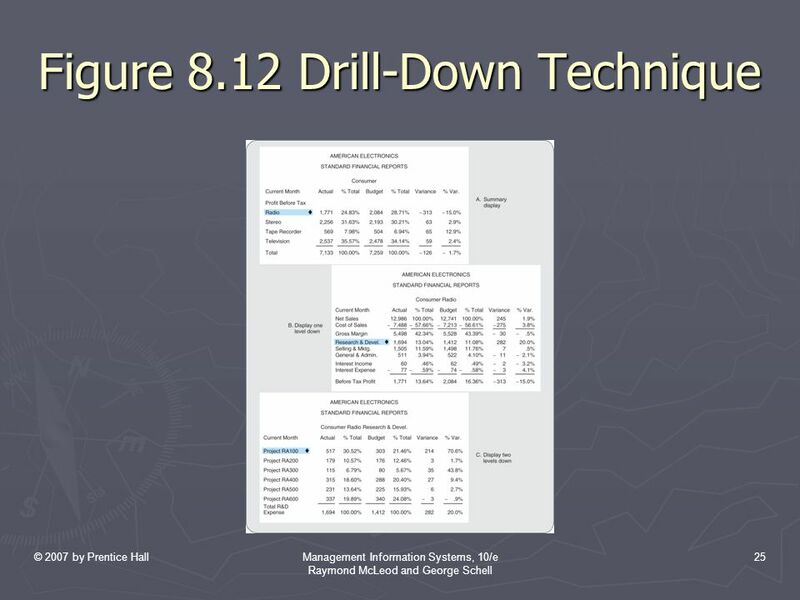 ► Drill through-going from a summary level to the lowest level of detail. 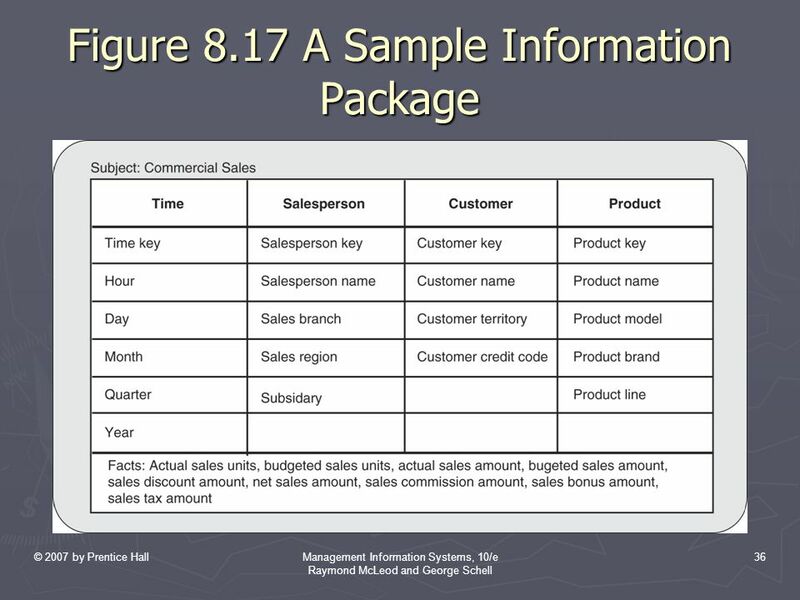 42 © 2007 by Prentice HallManagement Information Systems, 10/e Raymond McLeod and George Schell 42 OLAP ► On-line analytical processing (OLAP) enables the user to communicate with the data warehouse either through a GUI or a Web interface and quickly produce information in a variety of forms, including graphics. 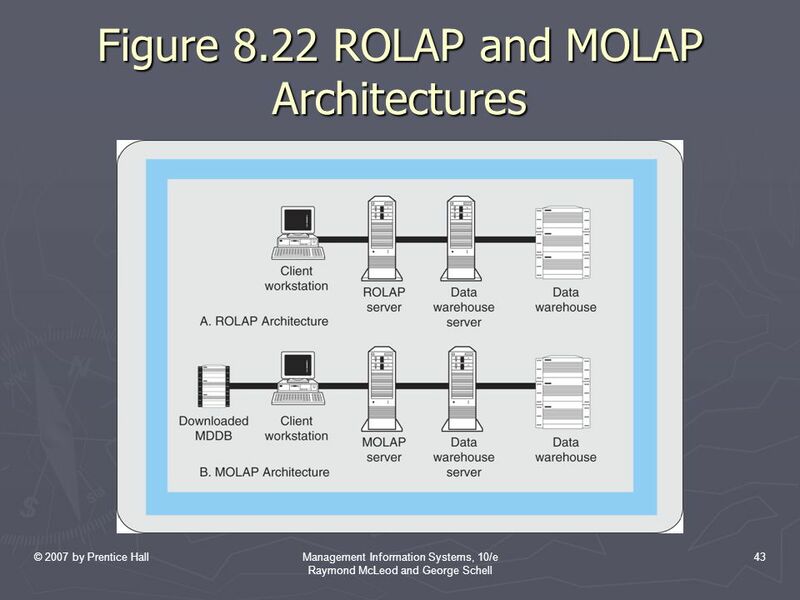 ► Relational OLAP (ROLAP) uses a standard relational database management system. 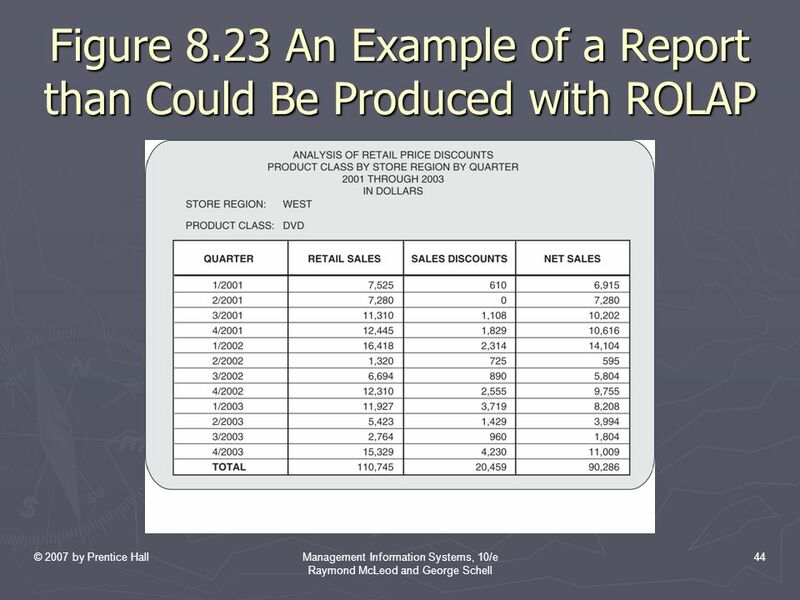  ROLAP data exists in detailed form. 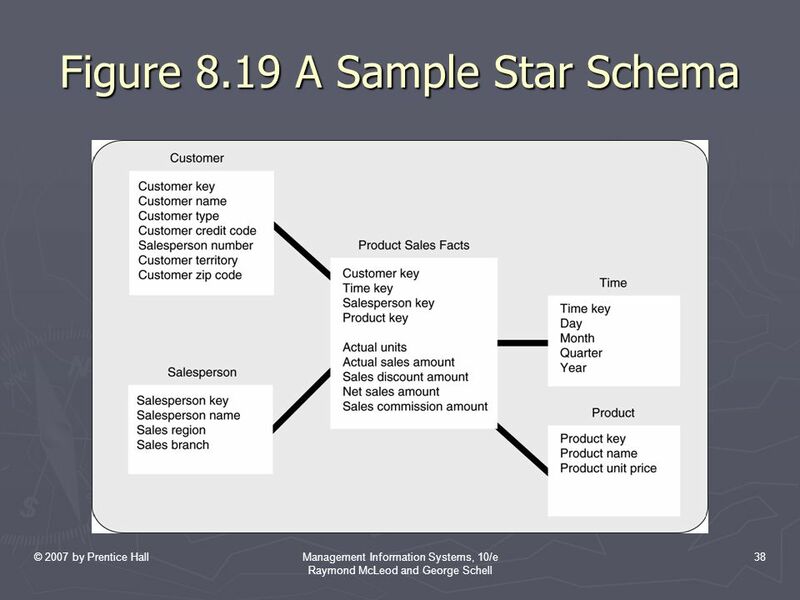  Analyses must be performed to produce summaries.  Constrained to a limited number of dimensions. 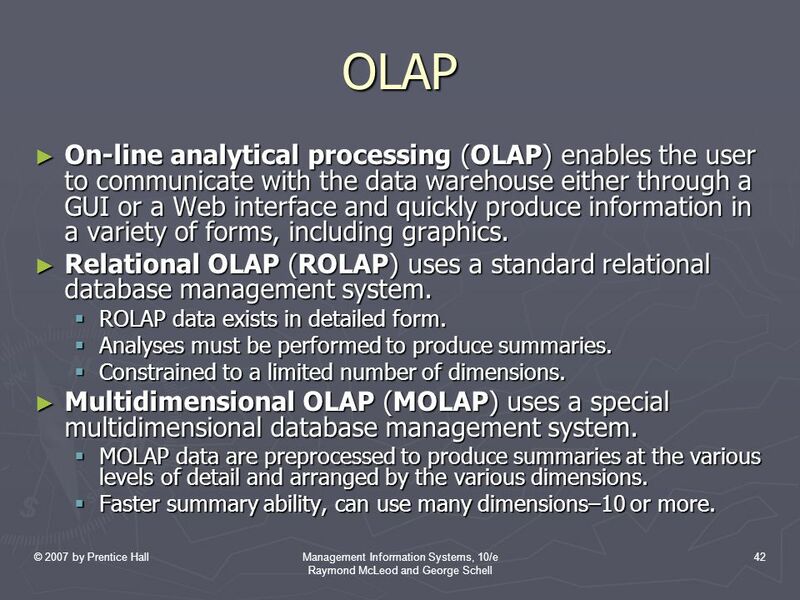 ► Multidimensional OLAP (MOLAP) uses a special multidimensional database management system. 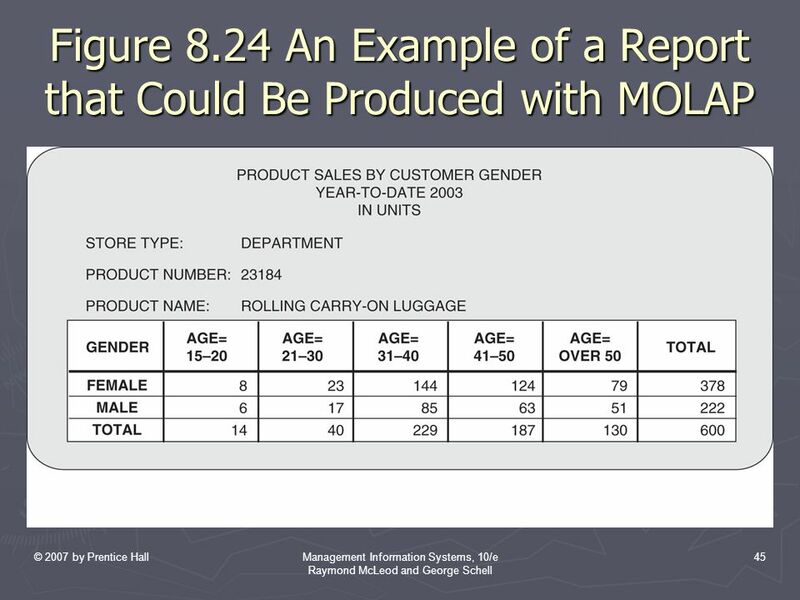  MOLAP data are preprocessed to produce summaries at the various levels of detail and arranged by the various dimensions.  Faster summary ability, can use many dimensions–10 or more. 46 © 2007 by Prentice HallManagement Information Systems, 10/e Raymond McLeod and George Schell 46 Data Mining ► Data mining is the process of finding relationships in data that are unknown to the user. ► Hypothesis verification begins with the user’s hypothesis of how data are related.  Retrieval process guided entirely by user.  Selected information can be no better than user’s understanding of the data.  Traditional way to query a database. 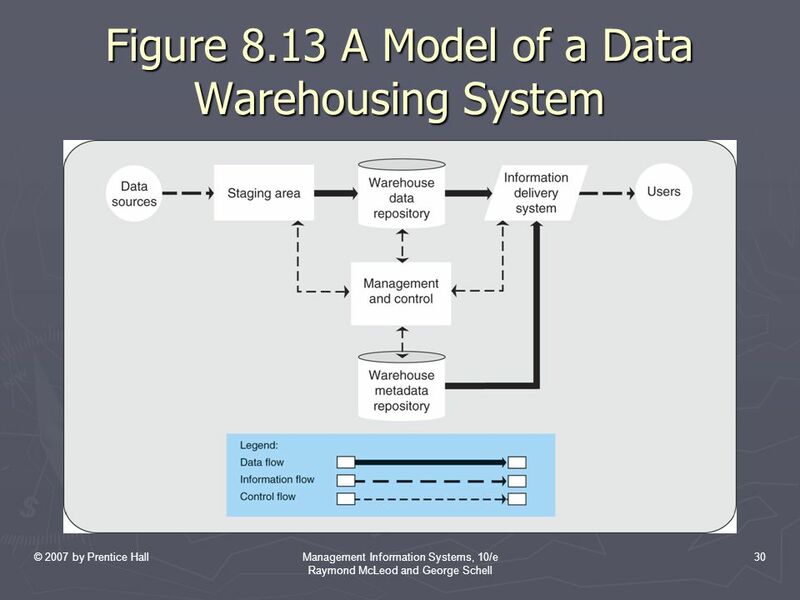 ► Knowledge discovery is when the data warehousing system analyzes the warehouse data repository, looking for groups with common characteristics. Download ppt "© 2007 by Prentice Hall Management Information Systems, 10/e Raymond McLeod and George Schell 1 Management Information Systems, 10/e Raymond McLeod Jr."
1 Senn, Information Technology, 3 rd Edition © 2004 Pearson Prentice Hall James A. Senns Information Technology, 3 rd Edition Chapter 7 Enterprise Databases. Create an Application Title 1A - Adult Chapter 3. Custom Statutory Programs Chapter 3. Customary Statutory Programs and Titles 3-2 Objectives Add Local Statutory Programs Create Customer Application For. Custom Services and Training Provider Details Chapter 4.